Bill Clinton's helpfulness to the Democratic cause just keeps on coming. First there was his interview in September with Newsmax -- yes, Newsmax -- in which he was so unenthusiastic about President Obama's proposal to raise taxes on the wealthy that his comments were quickly featured in an ad produced by Karl Rove's Crossroads group. Now comes Clinton with a new entry to the literary genre that has to be the only one ranking lower than the candidate's campaign tract -- the post-candidate's armchair quarterbacking tract. 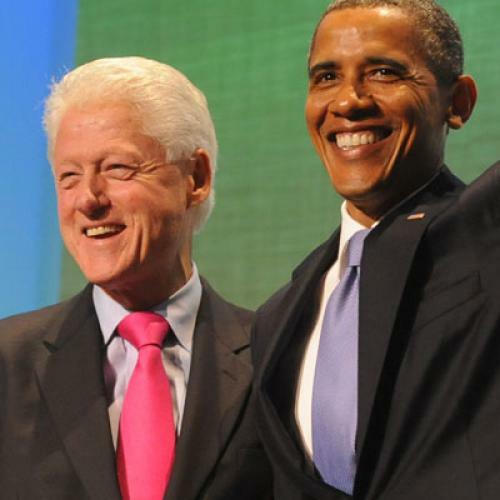 President Obama and his Democratic allies made two key political missteps in recent years, according to former president Bill Clinton in a new book to be released Tuesday. First was not raising the federal debt ceiling in the first two years of the president’s term, when Democrats still had a majority in Congress, and then failing to devise an effective national campaign message during the midterm elections of 2010. Clinton also suggests, obliquely, that Obama’s criticism of Wall Street has been too harsh and counterproductive. So, the president who got rid of the Glass-Steagall wall that kept the big banks in check, whose appointees blocked Brooksley Born from regulating derivatives, and who lowered the capital gains tax rate -- all actions that arguably contributed to the financial collapse and today's soaring inequality -- is now abetting bankers' complaints that Obama has been too hard on Wall Street? O-kay....This only makes me feel less sorry for having included the former president on my list of suggestions for future occupation. The United States doesn’t have to swallow too many camels to get back on a path of growth, the former president argues. Rather, we just have to embrace our inner technocrats and abandon our foolish ways. Collecting one-quarter of the $345 billion in “taxes that are owed but unpaid every year” and putting just one-third of today’s no-bid contracts out to competition “could reduce the annual deficit by more than $100 billion a year,” Clinton writes. He also embraces controversial big ideas, such as the Congressional Progressive Caucus’s plan to raise the maximum taxable limit on Social Security earnings. As Daniel Gross, reviewing the book in the Post, notes, though, there's just one little problem with Clinton's recommendations. “Back to Work” contains sensible ideas that have been floating around think tanks, policy conferences and White House brainstorming sessions for years. But given the current configuration of power in Washington and the near-blanket opposition by Republicans to White House economic proposals — even to measures they had previously supported — we seem to be stuck. Many of the ideas in this book could be enacted only in the unlikely event that Democrats sweep the 2012 elections and recover control of the House and a filibuster-proof majority in the Senate. Hmmm, why does that sound familiar? A critic of Obama's, suggesting he adopt progressive ideas that he already believes in but have no chance in a Washington stymied by Republican intransigence and structural dysfunction. Ah yes: these guys. Maybe Clinton can join their cause?